With easy personalization and built-in security, Chrome devices were made for sharing. The new Managed Public Sessions feature delivers a highly customizable experience for both customers and employees without requiring a login. 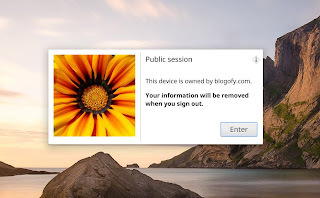 Administrators can easily customize any Chrome device to be a public session device using the web-based management console. The features that you'll find in the console include the ability to set the default sites and apps a user sees at login, custom brand the homepage, block sites and apps that shouldn't be accessed, configure device inputs and outputs, and set timed log-out sessions. For security reasons, public session data is cleared on logout so the next user starts fresh. Learn more on the Chromebook site or contact us if you have any follow up questions.